Ranbir Kapoor, who will be portraying the role of Sanjay Dutt in Rajkumar Hirani's upcoming biopic, feels that it feels magical to see the latter on the silver screen again. 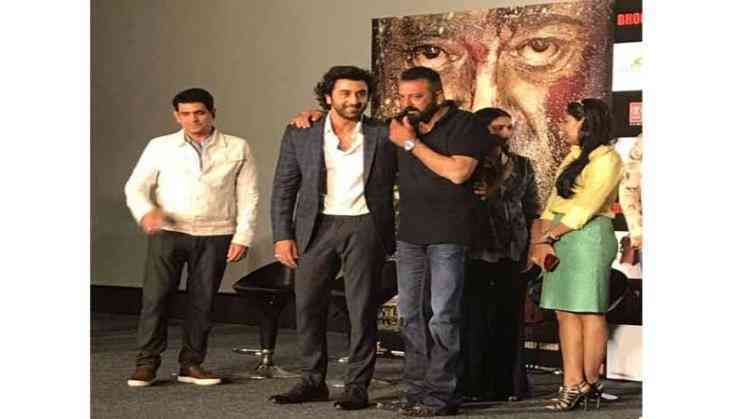 Ranbir, who was present at the first trailer launch of 'Bhoomi', gave a very delightful message for the ' Khalnayak of Bollywood'. He said, "I was never a fan of work outs and gym. I have been working out in Sanju sir's gym for the past 10 years, and I remember after three years he came to me and said 'It has been three years that I have been seeing you I don't see any difference in you. What do you do?" The ' Jagga Jasoos' star also shared that he has been a huge admirer of Sanjay and feels really fortunate that he knows the superstar personally. "It is his first release after his release. And like Raju sir said, we all have missed you (Sanjay) so much and when we see you on screen it is magical. Something happens deep within. Like all of us here, I have been a huge admirer of Sanju sir," noted Kapoor. Continuing, "I have had the good fortune of knowing you as a person and I have interacted with you since I was a child. So I know your heart. And I am really happy and welcome back to the movies. We all missed you a lot." When Ranbir was asked about Sanjay, the actor revealed, "I know Sanju sir since my childhood. But when we started working on the biopic, I felt that this cannot be a biopic. It's actually a science fiction film because for one person to live such a life is something I could not understand. How can someone live such a life? It was just yesterday when Sanju sir messaged me and said that you need to come at the trailer launch." Adding, "For a year, I tried to emulate him. I pray that I did it well because he is a very important person. Not just in the industry but in the country. Something, that we all can learn from his life, we can take so much from his life. But, when I think about the biopic and his life, I always think that this is a science fiction film. It is not a dramatic or a romantic film." Helmed by Omung Kumar, ' Bhoomi' stars Sanjay Dutt and Aditi Rao Hydari in lead roles. The flick is slated to release on September 22.